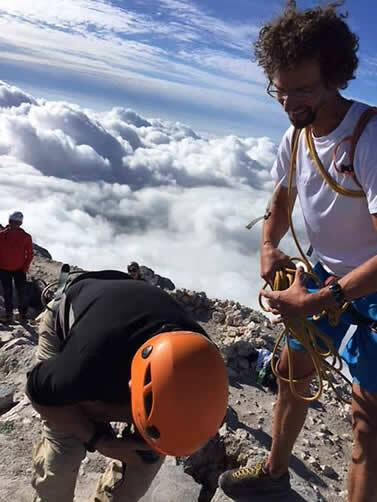 "CLIMBING SLOVENIA'S MOUNT TRIGLAV The Best Sort of Whipping is the Reward for First-Timers"
Our Slovenian citizenship documents should come any day. After all, the husband-wife team of Jim Ballard and Kathie Lang and I are now regarded as "true Slovenians." Gaining Slovenian status doesn't come easy. 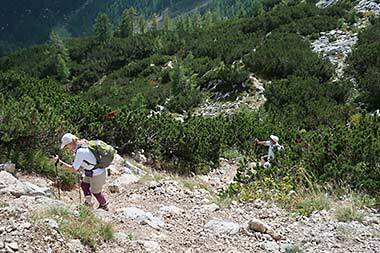 It's a taxing challenge that involves a long hike to a mountain hut, then a non-technical but challenging climb to the summit of Mount Triglav, the tallest mountain in the Julian Alps. 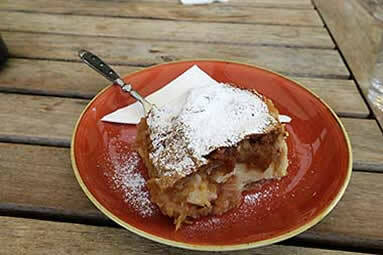 It's a region that spans Austria, Italy and, of course, Slovenia. Once on top, first-timers are instructed to bend over and sanctify the accomplishment with an odd tradition - three lashes on the buttocks by a native Slovenian. Our guide, Jernej "Jerry" Knop, happily performed the ritualistic ceremony, giving each of us the whippings with our climbing ropes. 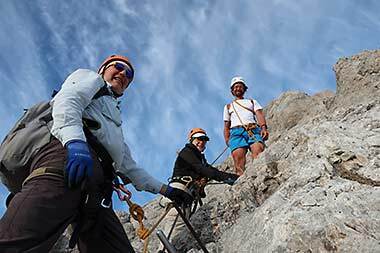 At an elevation of 9,396-feet, Triglav doesn't sound dauntingly tall. 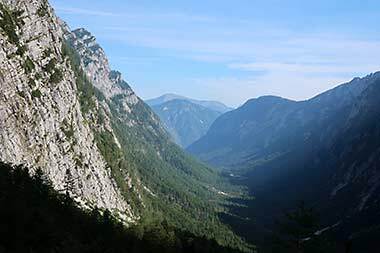 But unlike many Cascades and Sierra Nevada mountains, the trek for the least difficult route begins at a relatively low elevation, about 3,051 feet, in the Krma Valley near the town of Bled. 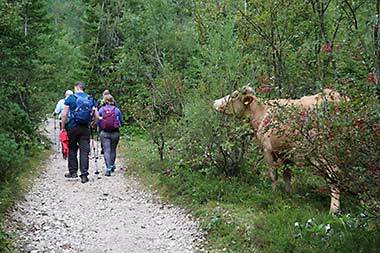 Our start was heralded by the sounds of jingle-jangly bells worn around the necks of grazing cattle totally oblivious to our passing. Our destination was the Kredarica Hut, the highest of Triglav's several huts, which our foursome reached after about 6-1/2 miles of hiking, always up, but often delightfully so as we passed through flower-filled forests of beech and spruce trees, past a sheepherders cabin and, once above timberline, fields of tamaracks, beautifully carved limestone valleys, and, finally, a zigzag switchback trail to the hut. During July and August, it's reportedly common to see conga lines of hundreds of men and women of all ages ascending and descending. 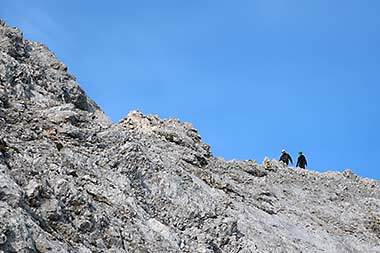 Because our trip was in September, the final push to the summit was sometimes crowded, but not mobbed. Most people take two days to make the climb, sometimes completing the summit ascent on the first day before retreating for the night at a mountain hut, or - as we did - stopping and staying overnight at the Kredarica Hut, then tackling the final climb shortly after morning's first light. The morning start gave us time to appreciate our lofty views. As twilight came, the neighboring peaks were illuminated, some of them partially shimmering in clouds. 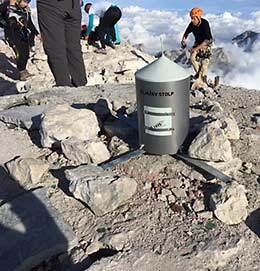 From the Kredarica Hut, the trip becomes a climb, one highlighted, literally, with a final push up another 1,312 feet on a via ferrate, or "iron road," route. Jerry led the way, all of us roped and in harnesses, grasping cables and embedded steel bars, sometimes clipping carabiners onto cables at exposed sections. 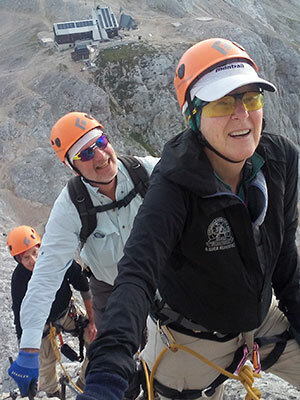 We followed the most used route that first stair-steps to Middle Triglav, then descends across a narrow, exposed ledge with precipitous "don't look" drops on both sides, before again ascending, again using cables and iron holds to climb the ladder-like route to Triglav's summit. It's a climb done by thousands each year. For Slovenians it's a ritual of passage. 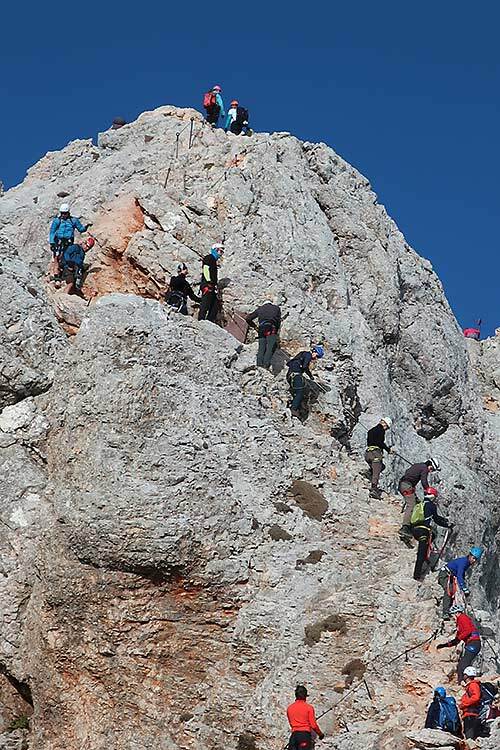 A former Slovene president declared that every Slovenian should climb Triglav at least once in their lives to be a true Slovenian. It's Slovenia's "National Mountain." 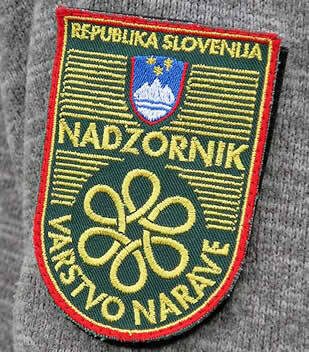 The mountain, which can be seen from most areas of Slovenia, is featured on the country's flag and coat of arms. 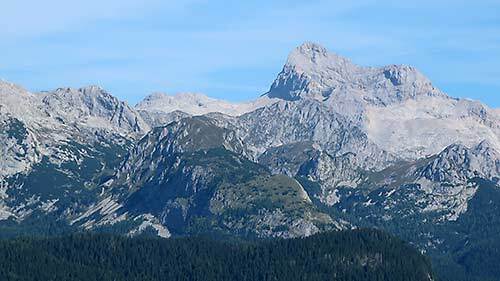 The shape of Triglav has been described as a three-headed monster because it has three main peaks, so its name derives from the locally pronounced “Tri glave.” Although it's said that people in reasonably good shape can climb Triglav, there are no guarantees. Weather conditions are important. 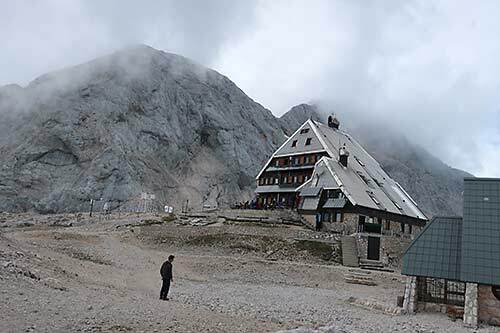 More than a dozen memorial plaques affixed on Triglav's rock walls between the hut and summit tell of people, including a group of teenagers, killed on the mountain by lightning. We didn't climb with lightning speed, but clambered slow and steady, only stopping infrequently to appreciate the views. Below us was the Kredarica Hut, where we had spent an anxious night and eaten breakfast less than an hour earlier. 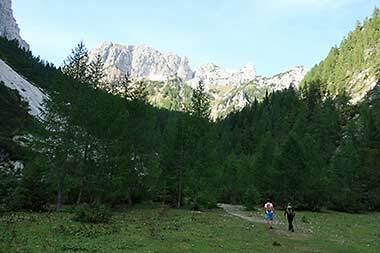 As we climbed, the peaks of neighboring Julian Alps mountains, some in Italy, some in Austria, added to the sense of majesty. 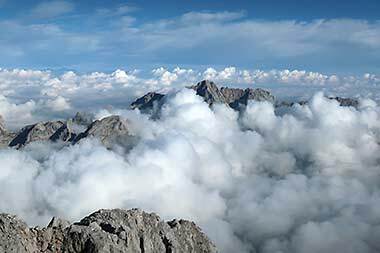 As we climbed, clouds shaped by like gigantic pillows occasionally surrounded Triglav, sometimes smothering the long-distance views but adding another sort of raw beauty. After about 1-1/2 hours we stood on Triglav's summit. It's landmark Aljaz Tower, placed atop Triglav by priest-mountaineer Jakob Aljaz in 1895, was missing because it was undergoing repairs. Instead, we stood near a miniature replica for photos and, of course, the ceremonial whipping. 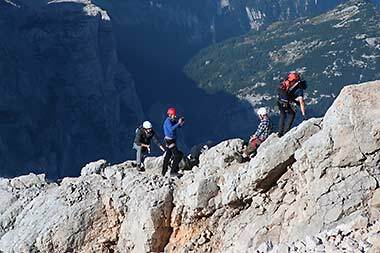 This year, 2018, marks the 240th anniversary of Triglav's first ascent of Mount Triglav. In 1777, Balthasar Hacquet, a scientist and mountaineer, unsuccessfully attempted the ascent from mountain pastures of Konjščica and Velo Polje, a route now known as the Bohinj Ascent. 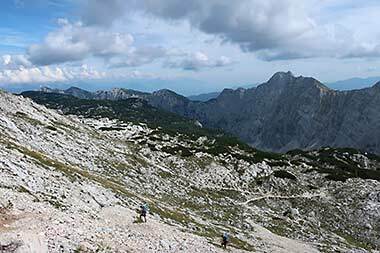 But it wasn't until a year later that four men from the village of Bohinj became the first to reach Triglav's summit. The ascent took three days and on August 26, 1778, they reached the peak via Zeleni Plaz, marking their path with stone markers. 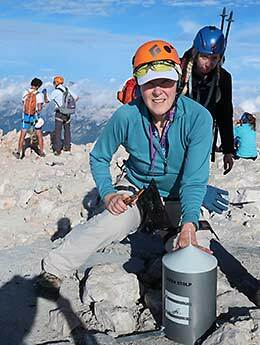 Their historic climb led to Slovenes being recognized, according to the Slovenia Tourism Board, as "a true Alpine nation of explorers and mountaineers." Triglav's successful summit attempt happened before the ascent to better known Alps peaks - eight years before Mont Blanc, 22 years before Grossglockner and 87 years before the Matterhorn. 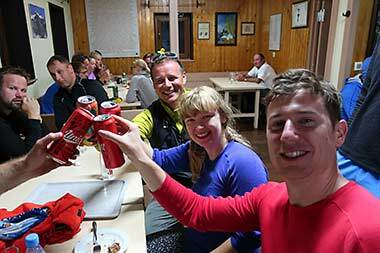 We unhurriedly celebrated our success, savoring the 360-degree views, including the shrinking Triglav Glacier, before making our way back to the hut - where I devoured a heaping serving of apple strudel. It was late afternoon when we arrived back at the Krma Valley and Bled. (The predicted rain, happily, held off until that evening, when it poured.) The downhill hike down the steep, unstable rock proved more challenging than the ascent. Several of us - we had joined another group that included three jolly climbers from Wales - fell, often several times. On some of my many falls I slammed my elbow, first resulting in a gash that spewed blood, but another harder crash, again landing on my elbow, proved even worse. A week later, my elbow was inflamed with - Ouch! - screamingly painful bursitis and cellulitis. But that came later. That night, as torrential rain fell, Jim, Kathy and I dined at our hotel, devouring mushroom ravioli and, yummers, varieties of comforting ice cream. I had visited Slovenia a year earlier and, for reasons I still don't understand, decided I needed to climb Triglav. It took little convincing - thanks to Margo McCullough of Margostravel/cruisegirl - to gather a group to make the Slovenia visit. As the only person who had previously visited Slovenia, I was delighted to make return stops in Ljubljana, the country's enchanting capital city thats delights include river-lined streets alongside and near restaurants, historic buildings, the Ljubljana Castle, Tivoli park, statues of famous poets and dragons, ornate bridges and shops offering way more than 31 varieties of comforting ice cream. Return visits to the Postojna and Skocjan caves and Predjama Castle were even better the second time. While first-time treats included viewing a performance by Lipizzaner horses near Lipica, a visit to Lake Bled and its island castle, tastings of cream cakes called Kremsnita, a cable car ride to Mount Vogel, a short hike to the Savica waterfall and a bicycle ride from the beautiful, seaside city of Piran to nearby Italy, an oftentimes journey made possible by e-bikes, this visit soared. 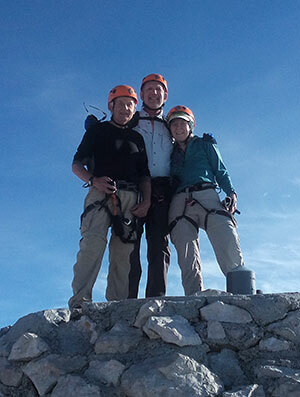 Climbing Mount Triglav was, literally, the high point of our trip. By the end of the summit day our butts were whipped, but in the best possible way. 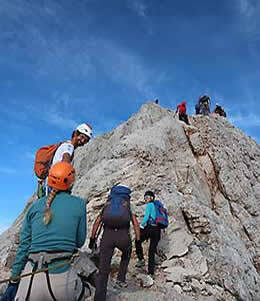 Several companies offer guided hikes up Mount Triglav, which is mostly done in two days. Our two-day trip, which included hiking poles and other equipment was done through Life Adventures, www.lifeadventures.si. 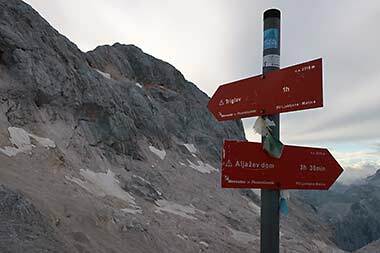 For information about Mount Triglav National Park, which offers a wide variety of seasonal programs, visit https://www.thinkslovenia.com/info-activities/triglav-national-park. Information about Slovenia is available at www.slovenia.info. Lee Juillerat is a semi-retired writer-photographer who lives in Southern Oregon. Along with stories for Southern Oregon newspapers, he is a regular contributor to Capital Press and such magazines as Northwest Travel, Alaska-Horizon inflight, Range, among others. He is the author of books about Crater Lake National Park and Lava Beds National Monument and a soon to-be published book featuring some of the more than 300 newspaper and magazine articles about ranchers and ranching. He can reached at 337lee337@charter.net.